"I'd like to thank my beautiful mother and my father," said the Auburn quarterback. "My parents do a lot of things behind the scenes that go unnoticed." We bet they do, Cam. It's been the topic on almost every sports program lately, but no worries, you are not alone. Cam Newton, the latest Heisman winner who's taken Auburn's football program by storm has been dealing with allegations his father solicited money from Mississippi State recruiters. Oddly, his father did not attend the Heisman ceremony on Saturday. 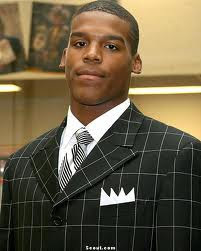 During the weeks leading up to the Heisman voting and ceremony, many speculated there would be no point in awarding it to Newton, because after further investigation or revelations, he, like New Orleans Saints star Reggie Bush, may have to surrender his prize. Bush's prize was taken from him earlier this year, after improprieties during his time at USC were revealed. Cam Newton has been taking the college football world by storm with everything from a 217-yard rushing performance, to allegations of academic misconduct while at Florida. While amazing us on the field, Cam maintains and told ESPN's Chris Fowler he did nothing wrong. This may be a new part of life for him, but he is nowhere near the first. Other college athletes have faced similar situations in the past: Michigan's Fab 5 (including NBA stars Chris Webber, Jalen Rose, and Juwan Howard) were accused of taking money from boosters, Charles Barkley has admitted to taking money, and former NFL agent Josh Luchs has admitted to paying 30 college players over his 20-year career. Granted college athletes bring in millions to their programs, and create strong alumni followings. But, are they not supposed to be students first, hence the "student-athlete" title? Professionals are paid, and in accordance with NCAA rules, students/amateurs are not. Athletes at the college level are to be gaining an invaluable education to aid them in the often difficult careers ahead of them, and preparing for what will happen when they are no longer the hottest stars in their sports. Should different lines be drawn here? Is there any solution to this reoccurring problem? ?